The Files Finder feature in Mac Optimizer will find specific types of files anywhere on your Mac, including in network folders. That way, you can easily delete large files buried in a folder somewhere. 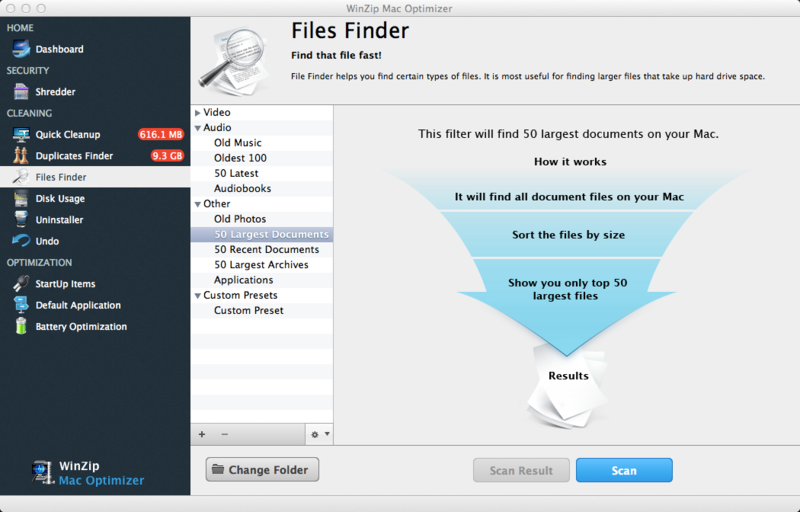 Files Finder can search for videos, music, audiobooks, photos, archives or downloaded applications. Choose the type of file you’d like to search for: Video, Audio or Other. Click the arrow next to the file type to search more specifically. Click Scan to start scanning your files. The list of files of the selected file type will appear. Sort by Title, Last Opened, or File Size. Select any file and click Remove, if you wish. If you choose another file type and come back to this file type, click Scan Result to see your previously performed scan.